Lighting-Gallery-net - Non Lighting Related/I don't think this is NEC Compliant. I don't think this is NEC Compliant. I was replacing a floodlight with a bigger one on my parent's house and when i popped the boxed open, i was greeted with this. 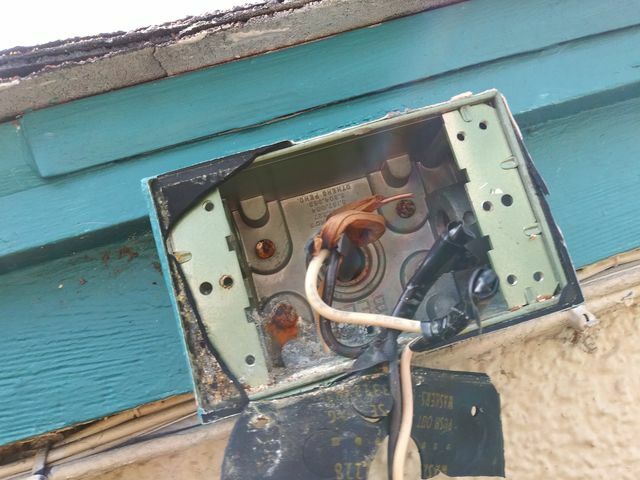 Box nailed to the wall, ground wire tucked off to the side, and the wires all taped together not using wire caps or w/e. Sad thing is, this is not the first one i've found like this nor will it be the last. I think this was done by the previous owner as he liked to do most of his own electrical work.